Most women with PCOS grow many small cysts on their ovaries. That is why it is called polycystic ovary syndrome. 1. HOW DO I GET PREGNANT WITH PCOS? The infertility rate with polycystic ovaries is very high. These women usually will have difficulty getting pregnant and usually require treatment to improve chances for pregnancy. Some women with polycystic ovary syndrome will ovulate (release a mature egg) occasionally – others do not ever ovulate. 2. WHAT IS THE POLYCYSTIC OVARIAN SYNDROME? Polycystic ovary syndrome (PCOS) is a hormonal disorder common among women of reproductive age. Women with PCOS may have infrequent or prolonged menstrual periods or excess male hormone (androgen) levels. 3. CAN YOU GET RID OF POLYCYSTIC OVARY SYNDROME? 4. WHAT HAPPENS WHEN YOU HAVE POLYCYSTIC OVARIAN SYNDROME? That can cause missed periods, thick body hair and hair growth, weight gain, and acne. Excess androgens also interfere with ovulation and can cause infertility: Each cycle, a follicle is supposed to break open and release a mature egg. In women with PCOS, that doesn’t happen. 5. WHY DOES POLYCYSTIC OVARIES CAUSE WEIGHT GAIN? Weight gain is a common symptom of polycystic ovary syndrome, or PCOS. With PCOS, the body has difficulty using the hormone insulin, which normally helps convert sugars and starches from foods into energy. This condition called insulin resistance can cause insulin and sugar glucose to build up in the bloodstream. Abdominal fat is the most dangerous kind of fat. That’s because it increases the risks of heart disease and other health conditions. 6. IS POLYCYSTIC OVARY SYNDROME PAINFUL? Polycystic ovaries do not cause pain. Pain in the ovary could be from ovulation or from a cyst. 7. CAN LOSING WEIGHT CURE POLYCYSTIC OVARIAN SYNDROME? 8. CAN POLYCYSTIC OVARIES CAUSE DEATH? Mothers of women with polycystic ovary syndrome have increased risk of early death, particularly if they also have diabetes. 9. CAN POLYCYSTIC OVARIES CAUSE DEPRESSION? 10. CAN HAVING POLYCYSTIC OVARIES CAUSE INFERTILITY? Yes. Having PCOS does not mean you can’t get pregnant. PCOS is one of the most common, but treatable, causes of infertility in women. In women with PCOS, the hormonal imbalance interferes with the growth and release of eggs from the ovaries (ovulation). 11. CAN PCOS CAUSE PREGNANCY COMPLICATIONS? The biggest hurdle for women with PCOS is getting pregnant. This is because having PCOS interferes with your ability to ovulate regularly. Once a woman with PCOS does conceive, there are two main risks. The first is an increased risk of miscarriage during the first trimester. 12. CAN PCOS CAUSE NEGATIVE PREGNANCY TEST? There are many factors that can cause a false negative pregnancy test. This can happen if you take the pregnancy test too early, especially if you ovulated late in the month which can happen with women with PCOS. It can also happen if your levels of hCG become diluted by too much fluid intake before the test. 13. IS PCOS DEVELOPED OR ARE YOU BORN WITH IT? A PCOS is a genetic hormone disorder which is related to diabetes. PCOS is something you are born with. Symptoms typically usually start appearing after puberty and in a few cases sometimes not until your 20’s or early 30’s. 14. CAN YOU STILL OVULATE WITH POLYCYSTIC OVARIES? 15. IS IT HARD TO GET PREGNANT WITH PCOS? The infertility rate with polycystic ovaries is very high. these women usually will have difficulty getting pregnant and usually require treatment to improve chances for pregnancy. Some women with polycystic ovary syndrome will ovulate (release a mature egg) occasionally others do not ever ovulate. 16. DO YOU HAVE A PERIOD WITH PCOS? Although some women with PCOS have regular periods, high levels of androgens (‘male’ hormones) and excess insulin can disrupt the monthly cycle of ovulation and menstruation. If you have PCOS, your periods may be ‘irregular’ or stop altogether. Eight or less menstrual cycles per year. Treat PCOS naturally with our PCOS solution kits. 18. CAN PCOS CAUSE AN ABNORMAL PAP SMEAR? Women with polycystic ovarian syndrome (PCOS) are not at an increased risk for having abnormal Pap smears or cervical cancer and do not need to have the test performed more frequently. That does not mean that you can skip your yearly exam and regular Pap smear, however. 19. 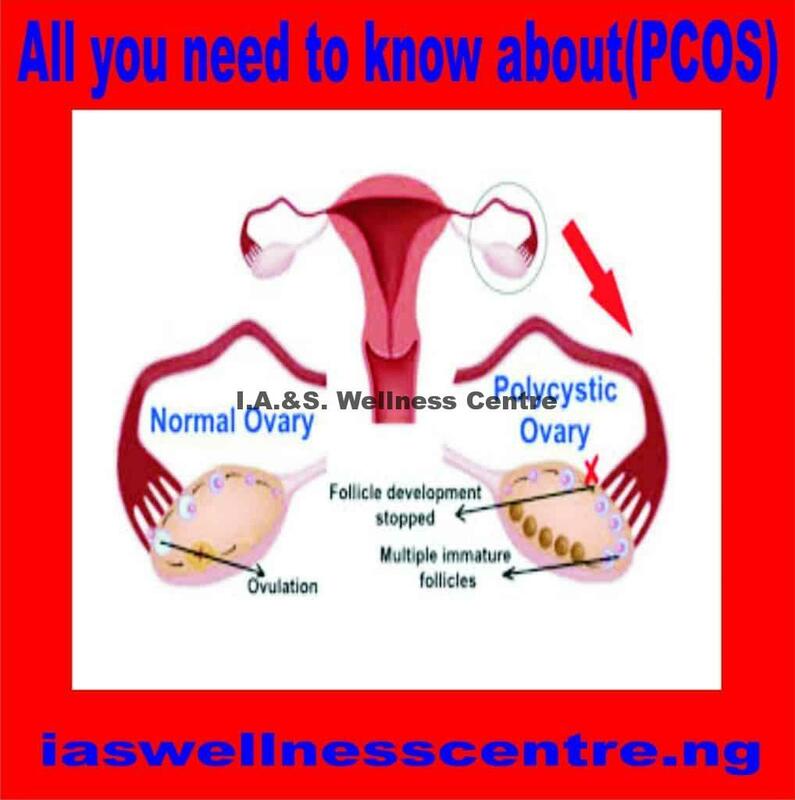 WHAT ARE THE CAUSES OF PCOS? Excess insulin. Insulin is the hormone produced in the pancreas that allows cells to use sugar, your body’s primary energy supply. If your cells become resistant to the action of insulin, then your blood sugar levels can rise and your body might produce more insulin. Excess insulin might increase androgen production, causing difficulty with ovulation. Low-grade inflammation. This term is used to describe white blood cells’ production of substances to fight infection. Research has shown that women with PCOS have a type of low-grade inflammation that stimulates polycystic ovaries to produce androgens, which can lead to heart and blood vessel problems. So, How Can I.A.& S. Wellness Centre Help Me To Solve My Polycystic Ovary Syndrome Problem? This entry was posted in Health articles and tagged about, natural, nigeria, ovary, polycystic, syndrome, treatment.